Wondering if anyone can tell me if this replacement series bill is worth and best way to sell? Part of some old bills from estate of which I am executor. Quite the estate you must have been put in charge of! 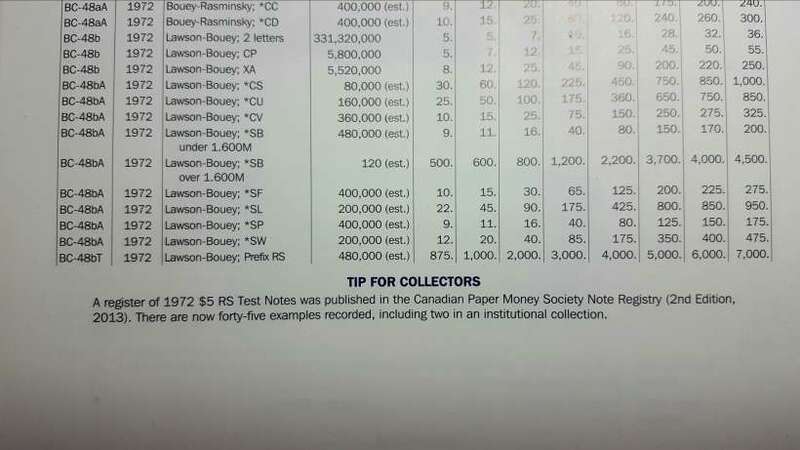 Below is a pic I snapped from the Charlton catalogue of Canadian Government Paper Money. While I'm not in any position to try and give you its grade, I can say that your best bet is to get this professionally graded by a third party grader and go on from there. If there are still less than fifty known in existence, chances are you won't have trouble finding a buyer. Thank-you so much! My Mom had an envelope of old bills she had squirrelled away- from 1954 on, mostly small denominations. I did a bit of online research and found this one to be the only one of any significant value. I agree you should have it graded by a third party. Notes with that value are easier to sell if they are professionally graded. That is a nice note for sure. Hold off racing to get this bank note graded. I am not a dealer, just a collector, but I am reasonable with my grading. Usually harder then a dealer. It is hard to tell grade from pictures, however this is what I have noticed on the bank note. I stress that it is very hard to grade from a photo. Some cameras take good photos and others do not. Light also plays tricks. I would say that the bank note is possibly a VF. I will also tell you to ignore the prices in the book. Yes they are based on graded notes but many people actually prefer ungraded notes. I do. Generally the dealers, at least here in Western Canada might offer you 40 to 60 percent of the listed price and they will try to sell it for about 80% of that price. However that will be for notes that they know that there is a more of a demand for. I have had notes of a similar nature where the theoretical value was several hundreds of dollars and could not even get $80 - 90. If you are anywhere near Calgary I would be glad to have a look at it for you. I have NO INTEREST IN BUYING. It is not the type of bill that I collect but there are others out there that do. If you are in Eastern Canada, I would suggest that you take it to 2 or 3 local dealers and ask them for their opinion on the grade and what they are prepared to offer you should you decide to sell. Then please post their comments. If you are in the Kitchener area go see Todd Sandham at Colonial Acres. I sold him a few notes and coins last year and he seemed fair on a few of them. I also dealt with a shop in downtown London but can't remember their name. coinme wrote: I agree you should have it graded by a third party. Notes with that value are easier to sell if they are professionally graded. That is a nice note for sure. Thanks so very much Bushman74 for your thoughtful reply. This gives me some good insight. 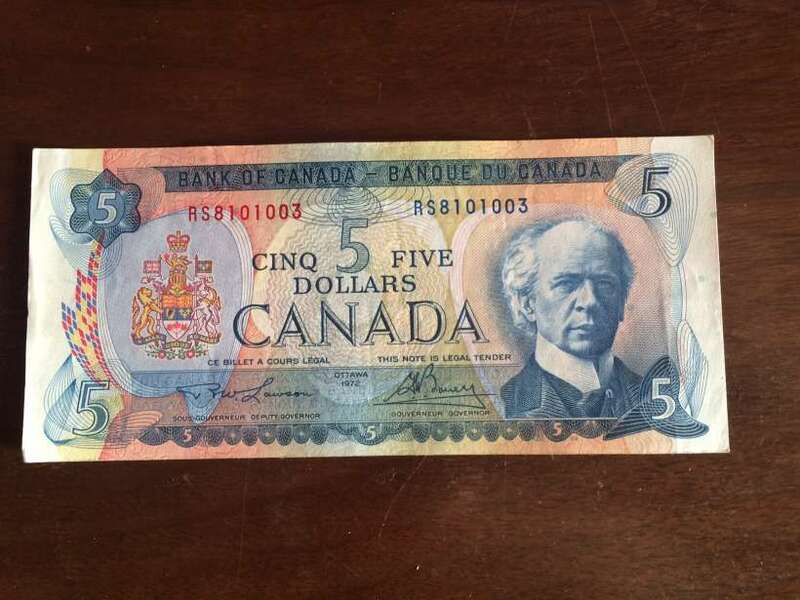 I live in Oshawa Ontario, and I will have to get out and show the collection of old bills around and decide about liquidating.